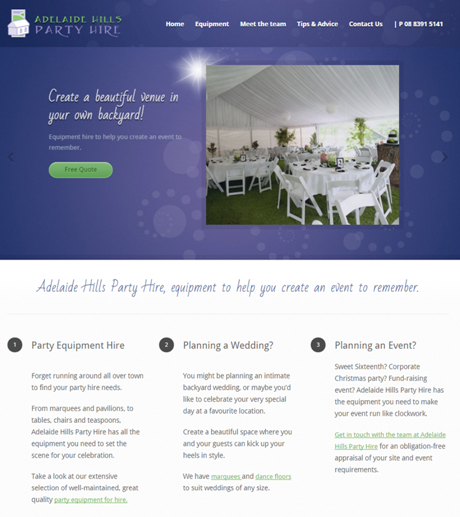 Adelaide Hills Party Hire had attended an early presentation of The Shift where, along with Studio Spark* (formerly Arkeva Creative), I spoke of the importance of well-written website copy. They were fortunate enough to win a 3 hour Online Development Package with Spark* and myself, and following an initial consultation they decided to go ahead with a new website and copy. Our main objective was to highlight the versatility and professionalism of their services. Having previously used AHPH myself (they provided a marquee for my wedding) I knew how well they ticked these boxes and was keen to ensure their site reflected this.